It is pretty obvious why so many people think that they are too out of shape to join a fitness program at the gym. You can feel instantly intimidated at the thought of walking into a huge open room with workout equipment that you are unfamiliar with. Often members seem to be in great shape and know exactly how to perform workout routines properly. The good news is that there are many options for how and where you can work out. The trick is to find the space that feels welcoming to you. Additionally, hiring a certified personal trainer can bring you to that confident comfort zone quickly. It is normal to have a look of fear on your face and a lot of questions in your mind upon enrolling in a personal training program in Canton, MA. Choosing personal training is an ideal way to get started in your pursuit of fitness, confidence, and health. When just getting started with exercise, it is important that you first understand your fitness goals and physical limitations. A well-trained personal training coach will help you plan your program so that it is strategically and uniquely developed for you. In a personal training program, you will learn work out routines and how to increase intensity and repetition to your benefit. You will then gradually work on upgrading your fitness program so it remains challenging and motivating. You will be taught the right exercise routines to target your problem areas, and your trainer will also guide you along the way to ensure that you are doing everything in perfect form making every exercise safe. 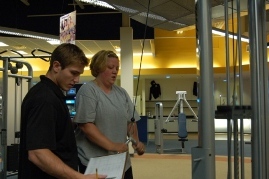 To find out more about hiring a personal trainer to help you meet your fitness goals, contact Answer is Fitness.